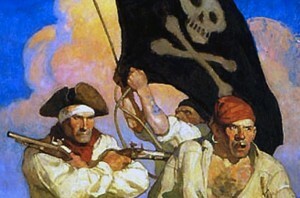 One of America’s foremost illustrators, N.C. Wyeth painted adventure scenes with unforgettable characters. Bring back memories??? Christina’s World is one of the most familiar American works of the 20th century and is currently on display at The Museum of Modern Art in New York. Having grown up with his famous grandfather’s images of knights and pirates, and his father’s poignant paintings, Jamie Wyeth was determined to go his own way. Beyond the scenic seascapes, he has spent decades portraying a darker, more disturbing side of Maine that tourists rarely see…unlikely subjects painted with his distinctive vision of life in the raw. Jamie Wyeth’s paintings are found in major museums in America. 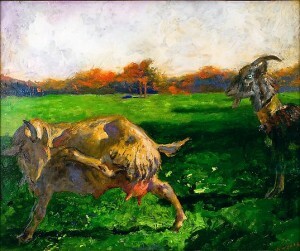 You must not miss this video of Jamie Wyeth painting! The best! That’s a really great video of the artist talking about how he looks at art. Yeah. Jamie looks at art and eats his paint! Can you believe it? Pretty exciting stuff. Heading to Port Clyde on Sunday for a week of painting….depth of Wyeth country. The Farnsworth museum in Rocklad, Monhegan etc…. Write us and tell us your favorite painting at the Farnsworth, Linda! If you like these guys’ art be sure to visit the Wyeth-Hurd gallery in Hondo, NM. Right next to Peter Hurd’s old polo ground. A few Peter Hurd goodies on display there, too. Along with some works by Henriette Wyeth. And ask to see Peter’s caricature of LBJ that was done after LBJ rejected Peter’s white House portrait. It’s a hoot. I looked everywhere on the internet for an image of Peter Hurd’s caricature of LBJ and couldn’t find it. Can you give us a link? Wonder why Hurd’s official portrait was rejected? Wow. As a total idiot when it comes to that kind of talent, I found the Jamie Wyeth video amazing. I had a frisson of awe to view such a genius at work … much like when I see Kirby’s stuff! I frissed out myself, Stuart. I don’t think I have ever seen such a mesmerizing video. Thx for commenting and kind words! Me too, Mike! I hope you watched the video at the end of the post. You won’t believe how Jamie paints! What a great seminar in such a range of painting techniques and tools! Including spit and fingers. I sure hope he’s not using highly poisonous paint when he uses spit for moisture. Are there watercolor cadmium reds? If so, aren’t all cadmium pigments very toxic? Anyway, he used every technique and tool besides his elbow, and I love the results, although I wonder about the durability of cardboard. Automatic texture though. Good point, Ken. Although Vuillard and Picasso both used cardboard. it isn’t archival! I continue to enjoy your blog, always stirring my imagination and appreciation of art. Having lived in Maine since 1971, I am glad you are spotlighting the generations of work by the Wyeths, so well-known to us. You are so fortunate to have this incredible family of art so near! So different from California artists! Thanks always for your comments. Well, I must admit Jamie’s process of painting is interesting, and, I assume, original. Unique. I thought he did a great job, starting w/ the seagull’s eye, commenting that it contained all the wonders of the sea, and then ending as that intriguing eye faded into the stormy sea itself. Full circle. Lovely. The faring of the tawny, young stoker, of the INFERNO was also quite masterful and poignant.Thank you, Kirby. A great way to look at a painting is to focus on a detail, which is what you have done with the eye of the seagull. Thanks for sharing. You always have such interesting facts! I never knew Christina had polio! I always thought it was an image of a woman longing for home or something along those lines!! And very cool to see the works back to back of the 3 Wyeth men. Thanks for sharing! In my research I discovered Jamie Wyeth’s wife, Phyllis, is paralyzed from the waist down due to an automobile accident at the age of 21. Ironic, isn’t it considering the very famous painting Christina’s World painted by Andrew Wyeth, her father-in-law, almost fifteen years before Phyllis’ accident. In the world of horse racing Phyllis is the owner of Union Rags, who was a favorite in the Kentucky Derby. Wow! Even more interesting info! Thanks again! Thanks for highlighting that incredible family!! Thx Savannah for your comments. It is a good feeling to know that our art blog has given a spark to our followers! How true, Lydia. I will never look at Sea Gulls the same way again either! Thx for always commenting on something that I hadn’t thought of before. Your comments are a real asset to my blog. Thx for following the blog. Kim. So glad it is of interest to you. Please pass it on to your friends who might get a kick out of it. Thx, Barbara for pointing out Jamie’s use of non traditional materials. So fascinating. Hey Kirby: We were just at the Brandywine River Museum, Pa. four days ago. We were in that very studio as well as the family home. Just as exciting to see the art in person, particularly Jamie’s pig who eat 21 tubes of various colored paint when Jamie stepped away from a plein air landscape he was painting. He bought the pig after the farmer was going to turn it into bacon. He painted the pig of course and you can see the love and respect he had in that painting of the pig. So glad you wrote about Jamie Wyeth’s famous painting, ” Portrait of a Pig.” We can see the pig in all his glory if we google Jamie Wyeth & “Portrait of a Pig.” Thx Carol forr telling us more about This wonderful artist. He is a really inspiring artist. Thx for commenting, Woody. I love the Wyeth family of artists! I just saw an article about “Jamie” in the Wall Street Journal.” Thank you for sharing!!! Thx, Cree. I’ll google that article. Thanks for the latest. Hadn’t heard of any of those. See any similarities in art between Maine and England, Val? I always value your comments. Great Blog – loved it!!! Remember when the “Helga” series was the rage in the art world? Was it one of your first art appreciations? It was mine. I am happy you are enjoying my blog, Linda. I saw this on Facebook. Could watch it a thousand times! What a master! The light on the birds’ wings etc. You can tell he’s done a lot of bird drawing. Did u notice the noises he makes with his mouth? Not sure if its from the paint in his mouth or what. I agree with Barbara. That makes me nervous. Hope it doesn’t cut his painting career short. Thanks for interesting information, as always. Those really might be the noises the Gulls make. What an inspiring thought..to animate the painting by the artists’ sounds. I’m going to try it! Good eye or ear, Margo. Really enjoyed the blog on the Wyeth family. You do a great job! Kirby, another brilliant short film shared with all of us. And the painting! So vibrant, so animated with the true spirit of the gulls and the terrible heat of the furnace. The back lighting of the gulls creates an ambiguity: they almost become angelic – don’t know why I thought of Fra Angelico – instead of voracious pests. And doesn’t he capture perfectly not just their many poses – the turn of body and head – but also their spirit. And the dynamism of the interspersed bright yellow. Extraordinary work – and I had thought that ol’ N.C. was my favorite – not after Inferno! Thank you, Kirby. Linda…you made me very curious about comparing Jamie Wyeth’s seagulls and Fra Angelico. Below is a link to Fra Angelico’s paintings, and yes, the dramatic tension and back lighting is there. Thanks for the observation! Your comments are always stimulating! 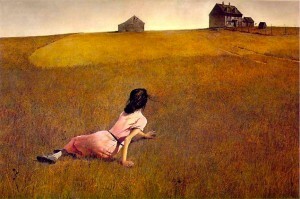 How interesting to learn about Wyeth’s painting of Christina’s World! We were just in N.Y.C. at the MOMA and I was looking at this painting. It seemed a little unusual and strange and I wondered why he chose that particular image for his painting. Now I understand it’s meaning and can appreciate it. How timely is your Blog!!! It is indeed wonderful! The passion is palpable!